I’ve recently become a big fan of author Matt Hayward from my ventures into the Horror genre over the last year or so, initially coming into contact with him via several of his short stories that I encountered in titles published by Crystal Lake Publishing. Where The Wild Winds Blow, to be found in the excellent Lost Highways anthology, is a hugely atmospheric piece of quiet horror about a drunkard cycling home to his wife and encountering a mysterious mist on the way. While at first it appears to be a run of the mill horror piece centered around the trope of a man atoning for his sins via a supernatural force, albeit very well written piece, in the last few pages Hayward deftly delivers a stunning twist that completely depersonalises any supposed relationship between the mist and drunkard, and instead recontextualises the mist as a danger to the entire surrounding community, and perhaps even all of humanity. After finishing that short story it was obvious that Mr Hayward had the ability to create skilfully told and haunting pieces of horror fiction, and I resolved to keep an eye out for his other works. I encountered another short story, Dark Stage, in Welcome To The Show, an anthology once again from Crystal Lake Publishing and this time co-edited by Mr Hayward; once again I was struck by the quality to be found in the short, an intriguing and highly personal take on the ‘Deal with the Devil’ trope that again offered up several haunting and chilling twists that refreshed an incredibly tired trope. By this point Mr Hayward had scaled my mental list of authors to search out and read as a priority, a rise assisted by an entertaining and engaging interview on The Horror Show with Brian Keene podcast, and therefore it was great news when I was contacted to see if I would like to review his latest title, The Faithful. I readily accepted the review copy, and got reading just as soon as I could. I was impressed by the cover illustration that Sinister Grin Press had commissioned for the novel, and which had been created by illustrator Matt Davis. It’s instantly recognisable and draws the attention of the potential reader as they scroll through the Kindle listings. An isolated church looms in the foreground, covered in shadows to the extent that it looks ethereal and deeply sinister; above it, strange shapes are described in the sky, including a murky burst of sunlight – or at least something you’d hope was sunlight. Everything is coloured in this discomforting mixture of washed-out red and black that gives the whole scene a suitably apocalyptic and dystopian look; and combined with the bold and expressive font choice, which looks like the title and author name have been painted in the same desperate, frenzied manner as a plague warning, or the infamous Don’t Open, Dead Inside scrawl from the opening episode of The Walking Dead, it’s extremely effective at creating an atmosphere of foreboding and danger. The back-cover blurb only heightened my anticipation for the novel, citing a mixture of At The Mountains of Madness and They Live! as the background for a novel about treacherous dreams, a small-town cult, and wishes granted through sacrifice. Put all together and you’ve got a potent mixture at the hands of an imaginative and skilful horror author, and I looked forward to starting it. One of the best elements of Hayward’s short stories was his characterisation, and the manner in which he depicted his characters interacting with themselves and each other; they always felt entirely realistic and human, rather than two-dimensional cardboard cutouts that you often see in the Horror genre, and they were easy to emphasise with and genuinely care about, especially if they met a grisly or otherwise grim ending. That deft handling is replicated and expanded upon throughout The Faithful, right from the opening pages as a tentative and secretive relationship is established between a young boy living in the back-water town of Elswich and a mysterious loner named Jonesy, who’s suddenly appeared in the town with nothing but a guitar and some curious questions about the boy and his parents. That relationship only takes a few pages to get established, but such is Hayward’s skill in writing these characters that you feel like there’s a real emotional heft in the beginnings of that relationship, and how both characters react to each other and their surroundings. There’s a soft, haunting, perhaps even lyrical tone to his language and it’s deeply engaging, as Jonesy’s secrets begin to be revealed to the reader, and to young Caleb in turn, and I have to admit that I was beginning to think that I had a handle on where The Faithful was going to go, both thematically and general narrative direction. However, surely the sign of a truly great writer – whether in the Horror genre or otherwise – is the ability to take a story in one apparent direction, convincing the reader while doing so, only to suddenly and abruptly introduce a twist that comes off just as convincingly and authentically to the reader? I believe that to be true, and it’s something that Hayward manages by the end of the first chapter, let alone the rest of the book. Just as it seems like we’re going to be embroiled in a deeply emotional story of broken childhoods, missing fathers and the quiet psychological horror of being bullied as a vulnerable child, Hayward whips the rug from under your feet and turns sharply in a completely different direction. Why is famous stand-up comedian Leo Cartwright, now retired, travelling through this backwater town in an RV, demanding that Jonesy and Caleb get in? And why did he seem to know that they’d be there? It’s brilliantly done, particularly at the whiplash speed that Hayward suddenly speeds up to, and then suddenly we pivot again into another story – this time, Leo Cartwright and how he ended up speeding through Elswich. Leo’s story is rather touching, and personally for me I was able to identify with it as much as the relationship between Caleb and Jonsey that struggles to bloom throughout the novel. I appreciated the way that Hayward developed Leo, the award-winning stand-up comedian who’s retiring but is terrified of what comes next; a widower in a business that doesn’t really allow for many friendships to properly develop, and a future devoid of any meaning being all that’s left to him, he’s the perfect character to instill with a sense of purpose and with nothing to lose by going on a journey. That journey is triggered by a chance meeting – eventually discovered to be anything but a chance – with a disabled fan called Christopher, who regales him with a strange story of an old man who haunts Christopher’s dreams and a strange town called Elswich. It’s another twist in the story, and one reminiscent of a classic Stephen King plotline – ordinary people being pulled into desperately difficult situations via the occult – but Hayward is more than strong enough as a writer to have developed his own narrative voice and structure, ensuring that it merely comes off as an influence rather than a pastiche. Leo’s recruitment by Christopher is another fantastically creepy element in the novel, particularly the idea of seeking out a ‘truthseeker’ in the form of someone like a stand-up comedian who has made a career out of speaking ‘truths’ to a mass audience, and it’s aided by the way that Hayward really strips Leo naked and drills down to his core, as a man who is desperately lonely and lost without something to aim for, or a family to belong to. Eventually Leo, Caleb and Jonesy escape Elswich, only to discover that they can’t just leave the town completely – each of them has something that lures them back in, regardless of whether they want to stay. They’re forced to recruit Kate, a friend of Leo’s, to try and discover what exactly is going on in Elswich, and it’s here that Hayward introduces us to both the town and its strange inhabitants. While initially we just get the impression that they’re the genre-standard ‘creepy, backwards, inbred townies’ it isn’t long before it becomes obvious that there’s much more to these inhabitants. There are some chilling, dread-inducing descriptions of the people living there and their strange condition, as well as the awful secrets they hide. As the story progresses, more and more disturbing details start to emerge – haunted eyes, weird bloated figures lurking in the tree line, and somehow these people know about Leo, Caleb and Jonsey and the secrets that tie them all together. As if this wasn’t enough, our protagonists have to contend with the confusing, disorientating and Kadith-like dreamworld that they enter whenever they dream – a world populated by mysterious, terrifying entities glimpsed out of the corner of one eye, and Jarrad, an old man who talks of an ancient war that humanity won but the entities never forgave, and which he’s recruiting Leo, Caleb and Jonesy to fight once again. It turns out the population of Elswich worship one of these entities, and their plans need to be disrupted permanently lest their dark god – Aypep, a commendably authentic-sounding Lovecraftian name – come into being and wreak some apocalyptic-level destruction. It isn’t long before those plans are revealed to our small band of reluctant heroes, and it rapidly becomes obvious that they’re way over their heads, becoming involved in an ancient cult and it’s horrifying secrets. I appreciated the way that Hayward started the trio off as having a gung-ho approach that might have fooled normal human beings, but is worse than useless against the creatures residing in Elswich. In doing so all they achieve is to put Kate – part-time actress and teacher, and one of my favourite characters in the novel – into genuine danger, while also revealing their complete lack of preparation to fight supernatural forces. They all come across as fleshed-out and relatable despite the trials they go through, and Hayward does a fantastic job in slowly building up the relationships between all four of them. It’s here that Hayward begins to build up another theme in the book – that of the nature of the familial unit, and how one can be created practically from scratch, especially if sacrifice is involved. It slowly becomes clear that this is something Leo has needed since his wife died and retirement beckoned – to act as a sort of patriarch, bringing people together as a new family. Interestingly, there’s even some exploration of the idea of family to the cult-members who live in Elswich, the notion becoming corrupted as the cultists become obsessed with belonging to Aypep and fail to support each other, their inherent selfishness coming to the fore. They’re some deep and heady issues to bring to the fore in any book, but Hayward follows the finest traditions of the Horror genre by using it as a way of examining key social issues and making the reader question familiar and ingrained notions. As the plot progresses Hayward really ramps up the tension and atmosphere as the town’s mysteries are unravelled, and the inhuman nature of what’s gestating inside the town residents is revealed in splendidly gory and eldritch descriptive language. Well-worn tropes of the backwater town infested with inhuman cultists embodied by alien or non-euclidean beings are put into play; but they’re superbly developed by Hayward, and the cast of protagonists, their backstories and strengths and weaknesses and the dreamworld they’re unwillingly drawn into, really breathes fresh life into the tropes. Some really evocative and unsettling imagery is invoked as the protagonists find the cult’s sinister and foreboding Church, the centre of the entire cult. Hayward really goes all out with his imagination here, conjuring up a debased and desecrated holy place that has been resanctified to worship something terrifyingly inhuman. The descriptions of the interior of the church, particularly the markings made by previous victims of the cult, are genuinely chilling and stayed with me for a good while after finishing The Faithful. In addition, the monstrous creatures that incubate within the townspeople are horrifying creations, and Hayward really goes all out in describing them and their movements in stomach-churning detail. He really gets across their alien and wrong nature, how they don’t properly belong on this plane of existence. I was also fascinated by the idea that Haywards introduces, that while the townspeople are cultists and implanted with these offspring of Aypep, they’re still inherently human and have human emotions, including fear and uncertainty. Far too many times in settings like this in horror fiction, cultists are depicted as unfeeling, skin-cloaked machines dedicated to their evil master(s), and it was refreshing to see The Faithful take this trope in a different and more engaging direction, with the townspeople becoming unsettled and even fearful when confronted with people who fight back. That fear and feeling of being unsettled and off-balance is exploited to the full in the finale to the novel, with an amazing piece of writing in which Hayward completely subverts a major Horror trope associated with cultists during a climactic and bloody gunfight; to even hint at it would be to spoil a major plot point so, frustratingly, I can’t go into it at all. But it’s a brilliant scene by Hayward and also plays into the notion of two fundamentally unprepared and panicked groups of people confronting each other with firearms. 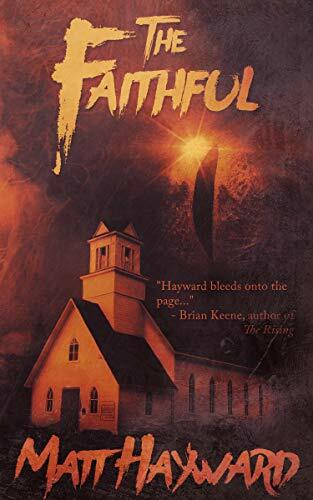 To call The Faithful an amazing piece of Horror fiction is both absolutely true and yet simultaneously feels far too simple a manner of expression. Hayward has managed to produce a seminal work in the Horror genre, one that’s a heady blend of different horror types that he deftly merges together to create such a quietly horrifying, emotionally-laden and powerful piece of horror fiction. It’s perhaps the best piece of cult-based Horror writing I’ve ever come across, and most certainly Hayward’s finest work to date; indeed, I’d go so far as to say that with The Faithful Hayward has forged his way to the head of the latest generation of Horror writers, developing a distinctive voice and writing style that I am incredibly eager to see developed in further work.